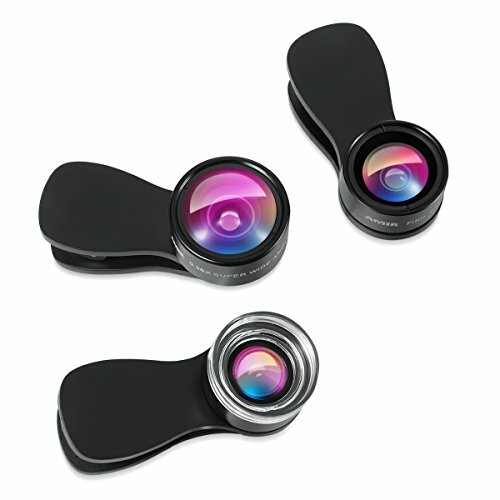 AMIR updated 3 in 1 lens gives you better experience of photo shooting with cell phone. 25X Macro Lens has been updated compared to the other 10X ones in the market, thus you get more details in your photos. 180° Fisheye Lens effect becomes incredible and dramatic. Besides, 0.36X Wide Angle Lens gives you wider views compared to the previous 0.67X one. - Note: In order to get a stunning effect when using this Macro Lens, you need to place the transparent cap on the surface of object that you want to shoot, make sure you don't block your light source and keep 1/2" (13 mm) distance from the shooting object. ❋ 1. It's better to take off your phone case for taking better photos. ❋ 2. The Flash Light might be blocked when using the lens. It depends on what kind of cell phones you use. ❋ 3. This product is not suitable for Samsung Galaxy S4/S7. Upgraded Macro Lens: The extra bonus 25X Macro Lens for phone which includes fixed-focal-length glass has been updated compared to the other 10X ones in the market. Much more perfect and easier for photographers to take close-up shots of tiny objects clearly.